Thanks Livesteam. Glad you are happy. Well I can take a few of the cladding on the window seat if you want its the only "safe" place I can think of currently and it means I can show it off to the locals before it goes back on the engine, which isn't going to happen for a good few weeks I suspect. Stripped down the siren today and found now why it needs such a huge force to operate the lever even without steam, its got a massive spring on the steam side which seems somewhat pointless unless they expect you to hang a 2kg chain on it need to lap the valve in to stop the dam thing leaking (even though it has a spring better suited to a Cortina Estate ) and look for a lighter spring. Fitting the new manhole copper ring was an interesting thing to do, didnt go to badly. And finally the finished article with zero damage to new paintwork, mind you theres some serious depth to the paint. Makes the rest of the engine look a tadge grubby but then my engine always has a certain working patina to it and the rest of the paint works been around for quite a while now. The wonderfully matched lining that lynn had to do (with squints) lined up 99%, the extra 1mm of lagging seemed to effect the cladding in general more than I was expecting in odd places, but I suspect things may move a little once I get some heat on her, which of course is the next thing to do, fire it gently a couple of times to really cure the paintwork off finally. Looking good there. I am pleased that you are happy with the result. One thing I forgot to ask is what does one polish it with ? normal wax/car polish ? just I'm petrified of scratching it although I had a couple of little donks which didnt seem to bother it and I had to shave a bit of the lip droop at the fire box end and the clear lacquer seemed pretty hard even had to result to a fine file. It is a hard wearing surface. You can clean with paraffin to cut the oil off. For a good shine. Hot soapy water then something like Autoglym resin polish to get a "slippy" surface shine. really looking sharp, never be able to achieve that finish! But looking at the pictures I wonder: can you (on a 4“DCC RL) mount the cleading with the motion all in place? I am just thinking at mounting the complete motion, test and adjust it and postpone mounting of the cleading to afterwards to avoid any nicks and scratches. Any idea? PS Of course I would test-fit the cleading first to see if all is ok, just leave it off for further assembly. "But looking at the pictures I wonder: can you (on a 4“DCC RL) mount the cleading with the motion all in place? I am just thinking at mounting the complete motion, test and adjust it and postpone mounting of the cleading to afterwards to avoid any nicks and scratches. Any idea?" 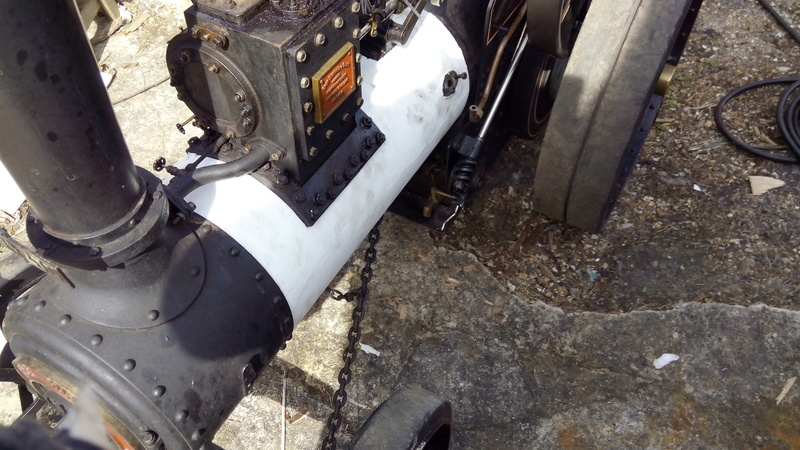 The engine pictured above is a single cylinder and hence has far less obstacles in the way of fitting the cleading, also a fair number of bits have been disconnected and held clear with bungee cords or removed all together. When I assembled My DCC I painted and Installed the cleading before starting on the motion components, I folded a hand towel and placed it on top of the cleading against the front spectacle plate, OK I still needed to be careful with the assembly but I got away without any scratches. The biggest problem I Had was fighting the urge to use the belly tank top as a convenient place to keep putting my tools down on, so my suggestion is fit the cladding before the motion components but don't fit the belly tank until you absolutely have to. Yes I am aware it’s a Agri with a lot less things between cylinder and crankshaft and I noticed, too, that some of the items have been removed or tied off. Yes you can do all the cleading except the mud hole. That is very difficult to get on but not impossible. Thanks for that! Just came back in from garage, had a closer look at the space and was about to give in already. I am at this moment painting the weighshaft bracket, so I cannot dry-fit it to see, but I was afraid, that looking at the bolt holes and distance, it looked like a impossible fit. If you wonder, at this time I am working on several places at the same time. 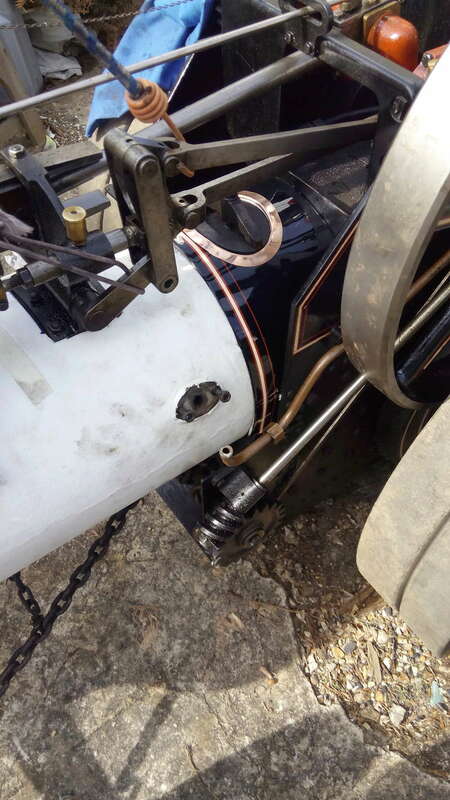 I started to fit the crankshaft, wheels need final coat, tender needs better paintjob (aka without runs), Smokebox is on, but perch bracket still off as, at this moment I am fighting with my front axle, seems like the pivot pin does not want as I want. I can fit it to the axle, the pivot and the main spring leaf in any combination of two, but as soon as the third one comes in, the pin is just stuck. It will only go in about half ways into the axle. I made up a taper pin out of some surplus round stock, in order to align the parts, this one goes in but the pin does not. Just called it a day for today. Pin 1 : Elwood 0. Sometimes you loose, sometimes the others do win, sigh. I cant really comment on the DCC but I can say that even on the single it was pretty tricky to get it in without damaging it, I had hoped to knock out the taper pin on the valve mech cross shaft but even after much beating and heating it still wouldnt budge. Ended up wrapping the cladding in cloth around the tricky areas, squeezing it in and then pulling the cloth out. This did work very well I found but remember its a single with a lot less "clutter"
Interesting comments about the ceramic lagging. Can anyone give some 'pros and cons' of this material compared with wooden tulipwood lats. Reason I ask is that I was about to try and source some wood lats. I've been thinking about using the ceramic insulation and seeing the comments above the decision has been made. Insulation on order. I'm about ready to fit the cleading so when they are painted and fitted thought that the the cork supplied could be used to protect the cleading while messing about with the motion gear. Bound to drop a bolt or something. I have already used some 1/2" ceramic insulation inside the smokebox door. Again found it on e-bay. A guy was selling 8" discs for soldering on. Just had to cut it down a bit. Thanks for the tip Mark. Didn't know you could get it foil backed. I've not found any foil backed stuff thin enough, or not at what I felt was a reasonable price for the small amount I needed. You can get foil backed ceramic lagging for bigger engines but its not cheap. Did experiment with some HD Bacofoil but even the tough stuff kept getting torn on any little touch with anything so gave that up as a bad idea. I am a little concerned about it holding moisture, although I'd think the whole thing will get hot enough to drive it out and only doing something like putting it away in the pouring rain and it being cold or cooling likely to cause a problem. I'll be pulling the cladding off after a while anyway and I'll inspect the moisture uptake and report back. I have seen many references to "Cleading"!! Surely this is a reference to "Cladding"? Perhaps sometime back Cladding was mis-spelt and the mis-spelling has been perpetuated? As far as I am aware there is no such word as "cleading" - am I wrong? Perhaps someone would like to correct me and put me right! Do both words have the same meaning when relating to our engines? Are there two correct spellings for the same word? I understand it to mean the insulating material which wraps a boiler to keep the heat in - like a jacket!?? Thanks for your help, this is driving me nuts! Not sure about the Cleading/Cladding thing, it does sound like a misprint at some point. Regarding the ceramic insulation the foil backed stuff does inhibit it soaking up the oil that will inevitably find it's way under the cladding. Just fitting the insulation dry on a clean boiler will be fine but after a year or so when taking the cladding off the oil will make it stick to the boiler & cladding so it'll probably need renewing. Timber will be fine providing it's been left a bit short at the smokebox end. 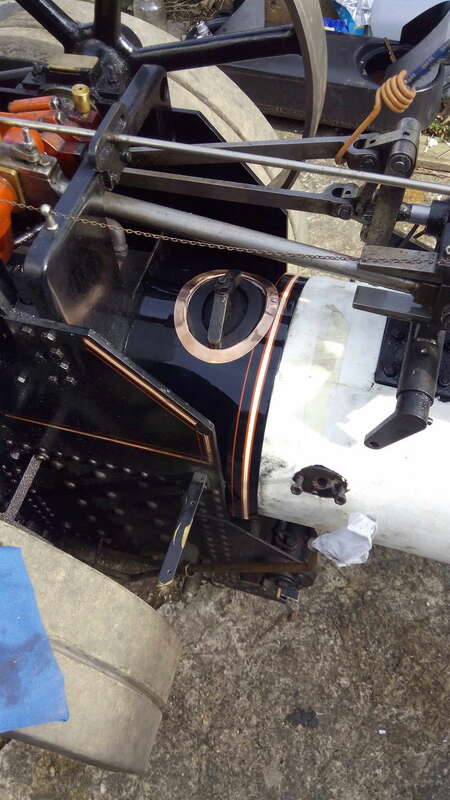 If the timber touches the smokebox it can smoulder away & even catch fire (on full size) When I cut the timber & fitted it to a full size Marshall I left it an 1" short so that wouldn't happen. I've seen timber removed from a 4" engine where it was touching the smokebox and all the ends were severely burnt. The smokebox when the engine is working hard can get very hot, easily hot enough to burn timber so leaving it back a bit solves this. The best timber is 'poplar' as it burns the least well of all timbers and has a good insulation level. Yes I am wrong!! The Webster Mirriam dictionary defines "Cleading" as a Scottish term meaning the planks or lining for a mine shaft, or for purposes of insulating a boiler!!! So there we are - I have been educated, but I prefer "Cladding"! 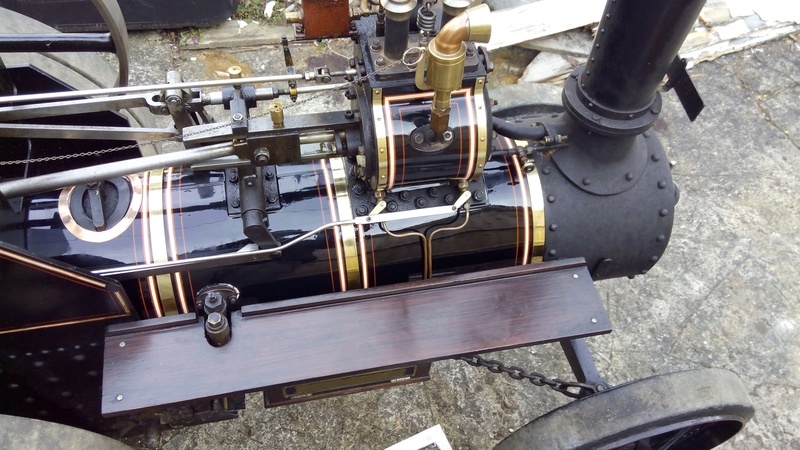 Talking of insulation, I knew of an old Engine man, who used strips of poplar to insulate his engine boiler but to prevent outside rusting occurring (caused by dripping from the cylinder above and rain of course) who also used to pour old oil down from the top between the insulation and the boiler barrel! Probably somewhat messy as it eventually found its way out from the bottom somewhere but it certainly preserved the outside of the boiler as I saw when he removed the cladding for inspection purposes!